Eggplant is a wonderful and healthy nightshade vegetable used by many different cultures. 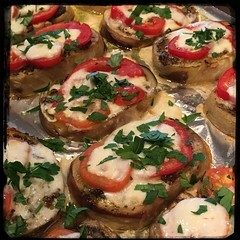 This particular take puts on the Italian flair, adding fresh pesto, tomato and mozzarella to eggplant we have a beautiful side dish reminiscent of Eggplant Parmigiana, without the time consuming work!. 1. Clean and slice eggplant, crosscut the slices of eggplant and brush both sides with olive oil. 2. Place on baking pan, sprinkle some salt and spread pesto on top along with the (optional) hot pepper flakes. 3. Preheat oven to 400F and bake until eggplant begins to soften. 4. Remove from oven and drizzle with some olive oil. 5. Add tomato slices with a dab of pesto and a bit of mozzarella on top, return to oven, set to broil and let cook until the cheese begins to brown. 5. garnish with fresh flat-leaf parsley.